It’s time to get rid of that old refrigerator or washing machine. You know it, your spouse knows it, and anyone who could see your bank statement would know it if they saw how much you’re paying for gas, water, and electricity. Those old appliances are literally sucking the life out of you. If you choose to upgrade now to energy star rated modern appliances you could save hundreds, even thousands of dollars per year. That makes them an investment, not an expense. Now that you have come to grips with the fact that you have to get rid of your old appliances, how exactly do you do it? Your city waste disposal might have a day or two a month when they come around to get items like that, but then the appliances most likely end up in a landfill. The chemicals inside them, particularly in air conditioners and refrigerators, will seep into the earth and poison it. You don’t want that, do you? You’re better off calling a junk removal company like Junk King that can take these items to the proper recycling center. Junk removal isn’t the same as waste disposal. A waste disposal company’s sole purpose is to destroy or eliminate any waste or junk that you put out curbside. 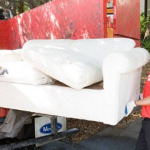 A junk removal company comes to pick up specific items, and they’ll take them to the right places for proper disposal. Many recycling centers will take used appliances. Depending on what state you live in, you might even get paid to get rid of the old items, in cash or with a rebate on a new appliance. Some of these “Cash for Clunkers” appliance programs still have a few dollars left in their budgets. One man’s garbage is another man’s prize. That old refrigerator you want to throw away might just end up in someone’s garage, basement, or cottage. How many times have you gone on an outdoor adventure and seen an old General Electric or Maytag appliance? In a situation like that, the gas and electric bill aren’t a major concern. The machines aren’t used often enough to worry about it. Not only that, but when it comes to durability and longevity some of those old appliances are legendary. Recycling doesn’t just apply to appliances either. Other large junk items like couches, kitchen tables, and old desks can be restored and would look great in someone else’s home or office. Do you have teenage children? They’re going to get their first apartment or dorm room soon enough. Maybe you should hang on to some of that furniture and let them have it when they move out. Who cares if it’s old and stained? Do you remember what your first place looked like? There’s always a use for a used appliance or old piece of furniture. It may not be useful to you, but someone else could get some years out of it. Don’t throw it away. The landfills are full enough and even if it’s incinerated you’ll still be polluting the environment. If you can’t give it away or sell it at a yard sale, call Junk King at 1-888-888-JUNK and they’ll come by and pick it up in a jiffy. This entry was posted in get rid of junk, junk king, junk recycling, junk removal, Old Appliances, Old Furniture Pick Up and tagged big junk items, get rid of junk, get rid of old appliances, junk removal, recycle junk on May 24, 2011 by Junk King. Last updated May 24, 2011 .